Dimensions: 12 1/8" x 12 1/8"
In the winter of 1926-27, Liberty magazine commissioned Frank Lloyd Wright to design a series of cover designs, one for each month of the year. These drawings, the pinnacle of his imaginative graphic designs, were rejected: deemed too "radical" by the publisher. 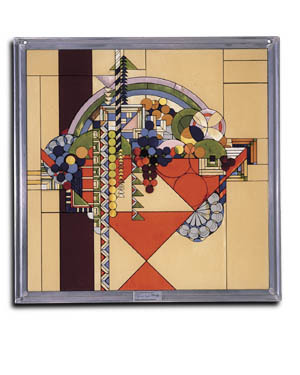 For the month of May, Wright created a stylized version of a May Basket. The complex cluster of geometric shapes represented fruits, flowers, and streamers of ribbon for the celebration of the spring.